There were two summits of world leaders held very recently. The one which got Americans’ attention was the Group of Seven (G7), comprised of Canada, the United States, United Kingdom, France, Italy, Japan, and Germany. The meeting, held in Quebec, proved that Donald Trump means what he says. He campaigned on a theme of “America first” and he is making good on his slogan. That is to say he is acting on his belief in American exceptionalism and superiority. He has imposed tariffs on goods from China and Canada and Europe and created an old fashioned trade war and many political crises.Trump didn’t make a good impression by showing up late for meetings, leaving early, refusing to sign the final agreement and sending out twitter posts calling the Canadian prime minister a weakling and a liar. The outrage over Trump’s bad behavior was magnified when he opined that Russia should be invited back to the group to form the G8 once again. There were howls of protest and shrieks about the evil Russians and their influence on Trump but the consternation was all for naught. Russia has made it clear that it has broken up with the G7 and found a new suitor. American newspapers and television networks gave scant attention to the SCO but instead chose to ratchet up Trump derangement syndrome. The photo of a seated Trump surrounded by his counterparts has been memed, analyzed and turned into a modern day Rorschach test. The G7 communiqueincluded language condemning Russia for undermining democracy, poisoning former spies and supporting the Syrian government. The ensuing civil war created by western backing for the 2014 coup in Ukraine was also thrown in as if it were a kitchen sink. Conversely, the SCO communiquespoke of cooperation, mediation of conflict, and implementation of the nuclear agreement with Iran. Putin and Xi arrived in Qingdao together on a high speed train, something that Americans don’t even have. The symbolism shouldn’t be lost on anyone paying attention. The two countries form in Xi’s words a strategic partnership. The partnership is intended to protect the two from American aggression, make money for them bothand bypass the hegemony of the American dollar. The United States is not the center of the world. China is the center of the economic world and Russia is its intimate friend. But only determined wonks knew that the SCO meeting was taking place at all. The information black out was nearly complete but the Belt and Road Initiative goes forward anyway. Instead of telling their viewers and readers that the world has changed, the press in this country did little except heap scorn on Trump and Putin and blather about how “our allies” were offended. The habit of making people think they should be sharing an identity with a foreign government is absurd. There is certainly no “we” or “us” for black people when speaking of countries that grew rich because they exploited the rest of the world. All of the G7 nations have practiced slavery, colonial invasions and or various genocides. Canadian prime minister Trudeau may have signed the Paris climate agreement but he always sides with the interests of the fossil fuel industries. He is a younger, whiter Obama, full of image making as a man of the people but who never met a neoliberal policy he didn’t like. Britain and France are still practicing imperialism around the world, including assisting in prolonging the war in Syria. Yet Donald Trump alone is pictured as the evil doer who upsets the world order. 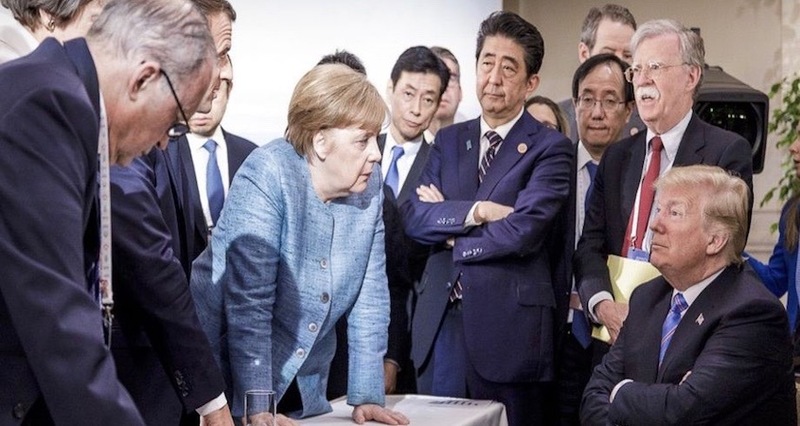 The order needs to be upset but not by any of the G7 leaders. They have created problems for most of the world’s people. No one should be concerned because Trump ruined the party held by the biggest thieves. The party held in China was also worthy of attention. A multi-polar world is a reality whether Americans know anything about it or not.